“Jenga.” Depending on where you’ve played it, the very word conjures up memories of family holiday gatherings or boozy dorm room parties. But, if Hasbro had its way, the world-famous tower game would have a different name. This past Sunday, the woman who created Jenga spoke at the Practice game design conference at New York University’s Game Center. (Note: I teach part-time at New York University’s Game Center.) Oxford Games co-founder Leslie Scott gave a revealing presentation that offered attendees fascinating insight into the origins of one of the most popular games in the world. The basic idea for Jenga came from Scott’s childhood on the African continent. She said that what later became Jenga started as a family game with her siblings. The wood blocks she and her siblings played with were made from the castoff cuts of various Ghanian hardwoods, which gave them all a different look and texture. Scott moved to England as a young woman, bringing with her a box of proto-Jenga blocks. As she made friends and met people, she said that she suspected that she was invited to a number of posh parties only for “my box of bricks.” The slight differences of weight, size, and feel for the wood blocks gave Jenga a unique twist even in its earliest iteration, Scott said. Some are smoother or lighter and easier to push out but players generally won’t know that until they commit to moving one. Scott said that she decided to preserve that variability as she looked to mass produce the game. But figuring out how to introduce the essential randomness in a mass-produced game was a challenge. Scott said that she wound up partnering with a cabinet maker, who used a machining process that introduced tiny but essential imperfections into the wood. 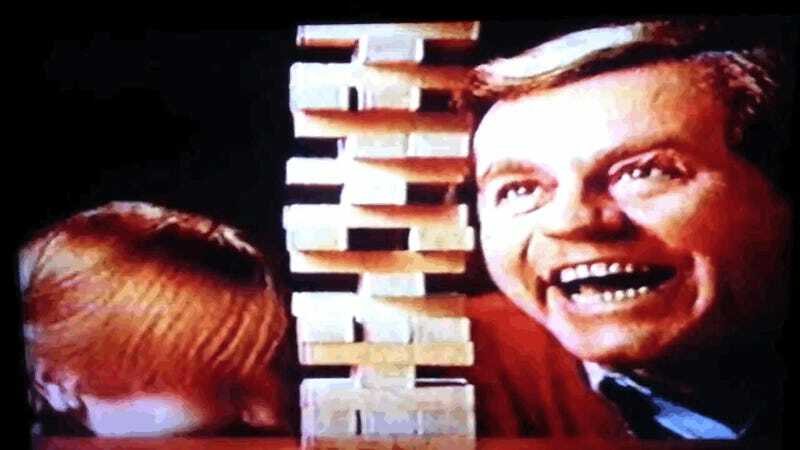 Jenga comes from the Swahili language, meaning “to build” and Scott has maintained that the uniqueness of the word in the Western world made her game more marketable. Earlier versions of the game had 48 blocks but decided on 54. Scott said that there isn’t any fancy science behind the shift. “I’m not sure about why this quantity works. I just [knew].” She did add that it might be because 54 is a multiple of 18, a favorite number of hers. A few years ago, digital game-makers NaturalMotion approached Scott to make a mobile phone version of Jenga. They attempted to recreate the physical differences for each individual block in the simulation but, ironically, could only do 18 kinds of differences in the phone game. Games designers in attendance pointed out that Jenga itself became a mechanic in tabletop horror RPG Dread, where a pull of a Jenga block replaces a dice roll. And like Monopoly and any other game that’s been popular for generations, lots of different variations and remixes exist for the original rules of the game. Scott said “it’s exciting” that Jenga has evolved in various different folkways. During her talk, she recounted that it was hard to convince bank managers to lend her start-up money for Jenga: “Really, really I’m going to make my fortune from this bunch of wood blocks!” Turns out she was right.